Water management is a term wich has been often seen in publications to describe a process designed to conserve water and energy while maintaining an adequate supply of moisture to the plant. However, it is impossible to achieve total management of water without understanding first characteristics of soil, water and the plant. Within each of this three major areas there are facts which must also be understood to effectively design, operate and manage a sprinkler system. So far as the irrigator is concerned, the basic reason for purchasing equipment most likely is to increase yield levels for increased profits. In other words, an irrigator has purchased a management tool which enables him to be more effective, efficient and more profitable. Irrigation scheduling is one facet of water management. Irrigation scheduling is the timely delivery of water in such quantity as to maintain optimum plant growth during the growth cycle. 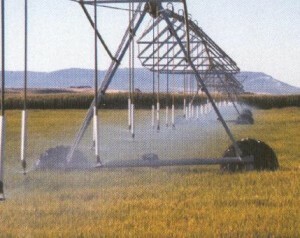 Timing of irrigation is more important than is the total application amount. An example might be in an area where 30 to 40 inches or more rainfall occurs during the year, but it falls at a time when the crops cannot use it. This is a case where total annual rainfall was entirely adequate. However, the timing was wrong. Even with irrigation delivery, systems can fall somewhat into the same category. If through mismanagement or failure to understand the crops requirement at the time it will be required, we can also end up in much the same way; not applying water at the right time which may result in yield reduction. Therefore, it must be understood the basic soil, water, plant characteristics and relationships to better understand the irrigation scheduling process. The ability of the soil to take in water influences the design of the distribution system. Water infiltration or intake rates of the soil should at least equal, if not exceed, the application rate of the distribution device. Water movement is also affected by slope, organic content, texture, structure, pore space, hard pans and chemical characteristics such as sodium status. Understanding these characteristcs will enable the farmer to apply water in the right quantities without being wasteful. Water movement occurs in a soil along horizontal, vertical and lateral directions. This means that water will flow from an area that is wetter to an area that is drier, seeking equilibrium. Water movement also relates to adequate soil drainage which prevents the root zone from becoming waterlogged.